You would think that if someone was brave enough to stomach the intense pain that often comes with getting a tattoo, he or she would be able to endure the relatively painless removal process. But for many people who have tattoos – and are contemplating removing them – fear of the laser seems to be a deterrent. Think about it. What’s more sinister sounding? A needle or a laser? Okay, maybe lasers do sound scary. This is why understanding Laser Tattoo Removal is so important. Q-Switched Lasers, which are commonly used to remove tattoos, produce very large amounts of light energy in a very short period of time. In doing so, the lasers are able to destroy tiny ink particles under the skin. Most patients refer to the sensation of the laser going to work as “pinching”. Meanwhile, there are those who refer to the sensation of a tattoo artist’s needle as “searing” and “piercing”. Now, what sounds more excruciating? As well, the removal of tattoos actually take up much less time than getting the tattoos themselves. A treatment generally only last about five to ten minutes. However, several treatments are generally required. 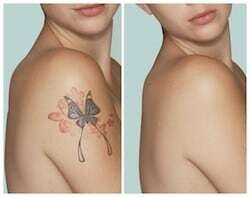 Most commonly, those who wish to remove all-black tattoos will need between four and eight sessions for full removal. Coloured tattoos, on the other hand, generally take a bit more time. As well, how long the tattoo has actually been on the body is another factor in how many treatments are necessary. Perhaps you only want to lighten your tattoo and not remove it completely. The Laser Tattoo Removal process is able to help you achieve that as well. Naturally, it would take less sessions to get your tattoo to the lightness you covet. By the way, Q-Switched Lasers can also aid in the removal of birthmarks and brown spots too. Recovery time is also necessary. But not much. 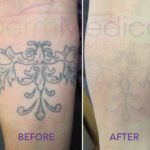 In the week following a Laser Tattoo Removal treatment, some patients do experience scabbing, blistering or slight irritation as the treated area heals. For those who have tattoos, they know that this isn’t much different than the time following the actual tattooing process. Tattoos, of course, are personal choices. These days, it’s not uncommon to see people with tattoos. It’s practically arguable to say that most people have at least one. The thing is though, tattoos don’t stay in style forever. If you’re someone who is thinking that it’s time for your tattoo to go, you’re not alone. And fortunately, you’re not out of luck either. As always, it’s best that you contact an experienced professional with your questions about Laser Tattoo Removal. 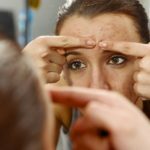 You can always give DermMedica a call toll free at 1-866-861-3070, or if you are in Kelowna, call 250-868-3070. Perhaps, the time has come for you to remove your tattoo. It’s a lot less painful than you think.